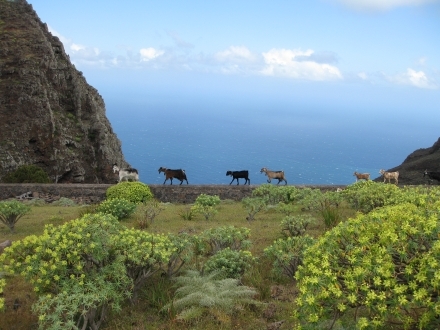 The most stunning think about La Gomera was the beautiful nature we encountered. Ancient forests with Laresilva trees and a huge amount of walking routes crisscrossing the island. In the forest we could at times clearly see the horizontal rain. These are clouds that are hanging low over a track in which you can see the wind moving. The wind makes the little drops in the clouds move horizontally of even upwards. A lot of the mountains contained lots of terraces. These were created by the old Gomerians to cultivate all kinds of plants. Surely this must have been a lot of work. Still at times you can see banana trees, potatoes or grapes in some places, but the vast majority of terraces is not being used any more. The locals must have moted that working for the tourists is much more profitable than working with plants. A sad loss of tradition, but very good for providing beautiful imagery. The boat trip to the island was like a roller coaster ride. I enjoyed it a lot, but Ana was less pleased with the trip. To see a typically shaped cliff you needed to get another boat trip to have the best view, but this was out of the question after our experiences arriving at the island. Anyway, there were really a lot of these typically shaped rocks visible all over the island. In my photo album you can find some more images of our trip to La Gomera. Next weekend we will be traveling again, and this time were visiting the island La Gomera for a weekend. La Gomera is one of the Canary Islands that was still missing on my list. The island is difficult to reach. First we need to take the ferry to Tenerife, and from Tenerife continue to La Gomera in a different Ferry. We were lucky because the the schedules connect pretty well, and we get a 50% discount on the fare for being Canarian citizens. La Gomera promises to be a nice place to visit. The island offers a lot of nature, the Garajonay National Park. Also there is a typical rock face, Los Organos, that resembles a kind of organ. In La Gomera that have a lot of local delicacies. Local cheeses, roasted pig or goat, honey from palm trees and this is the place where almogrote was invented! Silbo Gomero (Gomerian whistle). The local population communicated with whistles covering great distances. It proved the easiest way to quickly pass information over the ravines. Of course I’m planing to do some whistling myself. If I make a mistake there is still no problem. The receiver of any error will surely be far far away at the other end of a ravine.